Greg Evans is a passionate and captivating performer, pedagogue and composer. 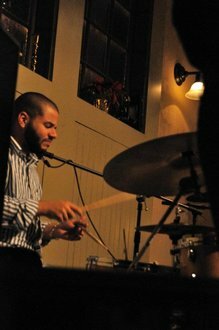 His passion, energy, and facility on the drum set has given him experience across the spectrum of the music industry. Greg’s influence spans multiple milieus including live and studio recordings, clubs and music venues, festivals, and the classroom. Evans earned his Masters of Music from Ithaca College (2011), and his Bachelor’s of Music from the Manhattan School of music (2009). He has studied with Gordon Stout, Justin DiCioccio, Bobby Sanabria, and John Riley. Evans’ persistent, buoyant, and joyous groove has facilitated a fulfilling performing career. Evans has appeared with many artists including: Jonathan Batiste, Terence Blanchard, Anat Cohen, Chick Corea, Joey DeFrancesco, Kurt Elling, Robin Eubanks, Jimmy Heath, Joe Magnarelli, Eric Marienthal, Branford Marsalis, John Pizzarelli, Hank Roberts, Dave Samules, John Stetch, and Turkuaz. Evans keeps an active teaching schedule at Ithaca College. He maintains a robust studio, conducts the Ithaca College Jazz Repertory Ensemble, teaches Survey of Jazz History, and has taught various classes to non-music majors. Evans also teaches applied lessons at Cornell University. He also is very active in the local Ithaca music community and is a frequent clinician across the country. Evans strives in his teaching to help guide students to realize their potential and improvisers and ensemble players. By referencing many music traditions, Evans helps students assimilate sounds of the past to create the new sounds of the future.